14 Jan 2019 – Please use our attached information on the 2019 Nobel Prize; for your convenience in English, Français, Deutsch, Castellano, Svenska. Nobel Peace Prize 2019-Nominations Deadline: 31 January | Dreaming of a Nobel Peace Prize in 2019… for some person, idea, or group dear to you? Help Secure a New Prize for Nobel Peace in 2018!!! Deadline for Nobel Nominations for 2018: BY JAN 31 – Our efforts to make the peace prize serve the visionary peace idea of Alfred Nobel continue. 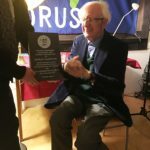 On Sat 2 Dec 2017, Johan Galtung Received the People’s Nobel Prize 2017 – The Norwegian founder of peace research received the prize in conformity with the testament of Alfred Nobel that is awarded annually by the Swedish peace group at Orust. 23 Oct 2017 – The Storting must choose those best suited to promote Nobel’s intention. The prize has long been disconnected from the peace ideas Nobel wished to support; it has lacked direction, idea, and of will to challenge the belief in military power. A promising winner for 2017 is reason for hope that the prize will improve. The parliament will select a new Nobel Committee only in a month’s time–and we fear the worst. Nobel´s peace prize is a wreck – serious journalists ask me whether Trump could win this year. The nomination process is no longer secret – we have published all relevant and qualified nominations. HERE. In the will he used the term “the prize for the champions of peace,” and the correspondence with Bertha von Suttner, the great peace movement leader of the period, shows that it was her political ideas and political friends he wished to support – abolishing weapons and warriors as the tool to get an end to war. This means that almost all statesmen and generals who have received Nobel honors from the Oslo committee have been — considering the actual intention of Alfred Nobel — illegitimate winners. New deadline: Please nominate by Jan. 31, 2017, 12 p.m. CET (Norwegian time). Please also, send us a copy, to nomination copy@nobelwill.org of all nominations suited you believe may be suited for inclusion in our 2017 list. Who Should Win the 2016 Nobel? Promote good nominations, of qualified candidates, for 2016, before the Feb. 1 deadline. The right to nominate is limited, to parliamentarians, certain professors, and others, all over the world. If you are not entitled to nominate, please seek out someone who is. Oslo, December 27, 2015 – A great Norwegian scholar for peace, justice and a sane foreign policy, Ståle Eskeland, died yesterday at age 72. He was a retired professor of (Norwegian and international) criminal law at the University of Oslo, who never shied away from pointing out social and political wrongs. In recent years the recipients of the Nobel Peace Prize have not reflected the hope of the award’s founder – Alfred Nobel (1833-1896) – that the world be freed of weapons, warriors and war, or promoted the vision of preventing future war by what Nobel called “creating the brotherhood of nations”. Carnegie/Nobel – Stipend/Prize – US$ 1 500! Why the similarities? Were Carnegie and Nobel ever in contact? Why is the connection so interesting – and consequential? The best reply to these questions will receive from me a stipend of US$ 1 500. The management of the Nobel Peace Prize has become a case for the Norwegian police, following a request for criminal investigation from 16 prominent Scandinavians, parliamentarians, lawyers, authors and peace activists to the authority on economic crime, the ØKOKRIM. A March 2012 decision by the Swedish authority supervising foundations is a ticking box of dynamite under the Nobel Peace Prize. Even presented in an official, open document, the decision has not reached the general public and become the news story it actually is. A summit of the European Union that today receives a prize that pretends to serve Alfred Nobel´s peace plan, will this coming Friday adopt a military co-operation program that spits in the face of the peace by disarmament ideas Nobel wished to support by his prize for a global demilitarization of international relations. In my letter to Länsstyrelsen on Oct. 7, 2012, I quoted startling remarks from the Secretary of the Norwegian Nobel Committee, Geir Lundestad, that the Norwegian Committee is not willing to pay attention neither to the will of Alfred Nobel nor to the law and the March 21, 2012, decision of the Länsstyrelsen. Referring to the IPB request of Oct. 5  I hereby urge the Länsstyrelsen to urgently intervene with an injunctive to stop payment of the prize to the European Union.